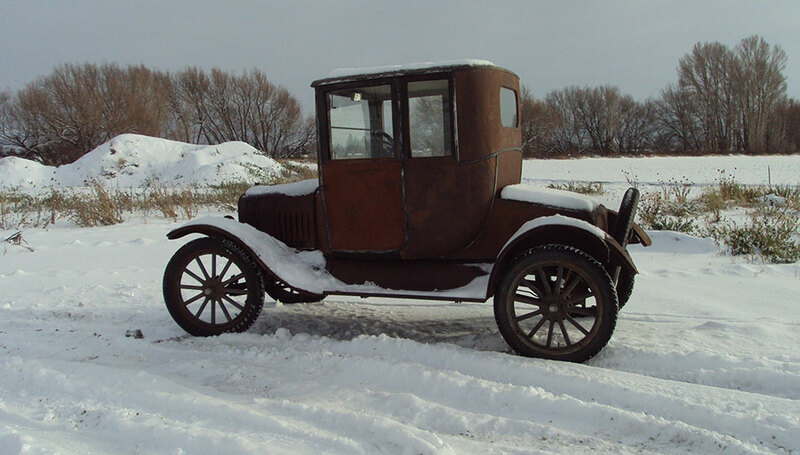 Model T Ford Forum: Got snow ? Got Cold ? Got snow ? Got Cold ? 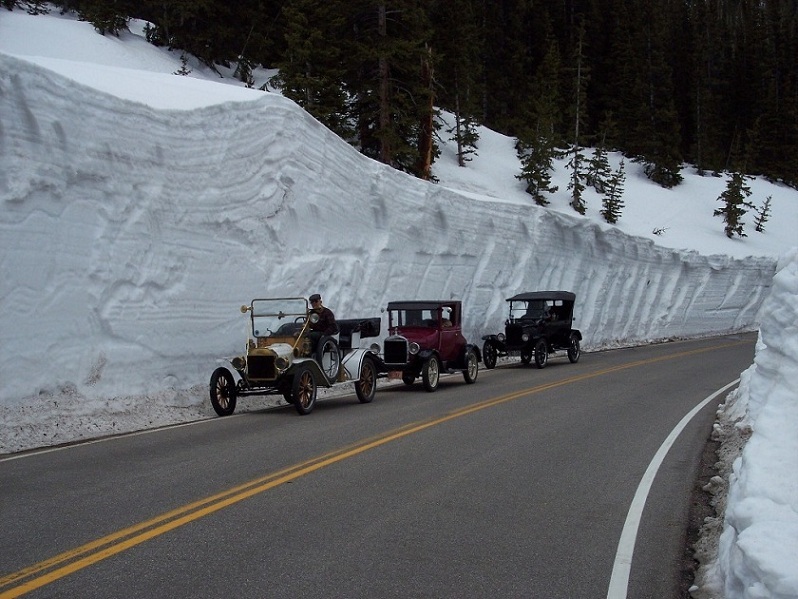 Model T Ford Forum: Forum 2014: Got snow ? Got Cold ? 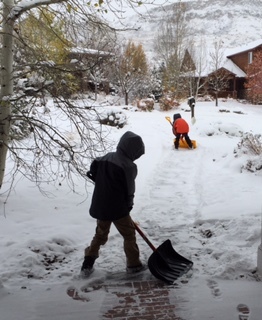 Just talked with my daughter in Golden, CO where my 2 grandsons are shoveling snow in 1° weather. Wondering whether anyone else is having similar conditions ? Today was around 65 here, I ran around in shorts and a T shirts, The mercury is supposed to drop to the mid 30's tonight. Yep Will, our low 30's today is coming your way! Ohio here. Colder tomorrow. Heard it was -26 in northern Wisconsin last night. Good grief. Tim - We have family in Northern Wisconsin so I'll see what they have to say tomorrow! I worked with a guy that summed up Winter in Northern Wisconsin pretty well! He used to say that it was nine months of winter and three months of pretty darn tough skiing! ISHPEMING, Mich. (AP) — The National Weather Service says more than 3 1/2 feet of snow has fallen on parts of Michigan’s Upper Peninsula in a record-setting pre-winter storm. Late Wednesday morning, 42.5 inches had fallen since Monday in Marquette County near Ishpeming. Generally, 2 feet or more fell in parts of the Upper Peninsula with lower totals along Lake Michigan. The weather service’s Marquette-area office reports a record 16 inches of snow fell Tuesday, equal to 1.89 inches of rain. That broke a record set in 1977. Meteorologist Justin Titus says the storm has left the area, but there could be lake-effect snow of 8 to 15 inches through Saturday. Temperatures have plunged around the state, with Detroit’s high of 65 degrees Tuesday falling to 40 before dawn Wednesday and heading downward. Roger, Looks like some of the guys will have a problem getting to deer camp. Some of them are pretty far back in. Dad and I used to hunt around Alpha and north of Iron River. Spent a lot of time in the UP visiting military contractors. I'm at our "cabin" in the Black Hills of SD. Trying to hunt deer but it's COLD! Minus 8 this morning with a high of 4 degrees. Supposed to get minus 12 tonight but warm up to minus 6 by sunrise. I'm going through lots of wood! It wouldn't be so bad out if the wind would stay under 15 mph. Monday was a straw hat day, over70º, but around six PM the wind suddenly shifted to the north and we dropped twenty degrees in a half hour. I hear OKC dropped fifty degrees ins 24 hours. When I got up this morning we were at 18º, and warmed up to 27º this afternoon. After a sudden hard freeze like this all the mulberry leaves hit the ground. No snow in the forecast until Saturday. Seventeen miles south of Sturgis, SD is where we call home. Nice and chilly this evening, 3 above and headed to Iowa tomorrow with a T touring, delivery just east of Omaha. One thing I always say about the cold, "I was here first". 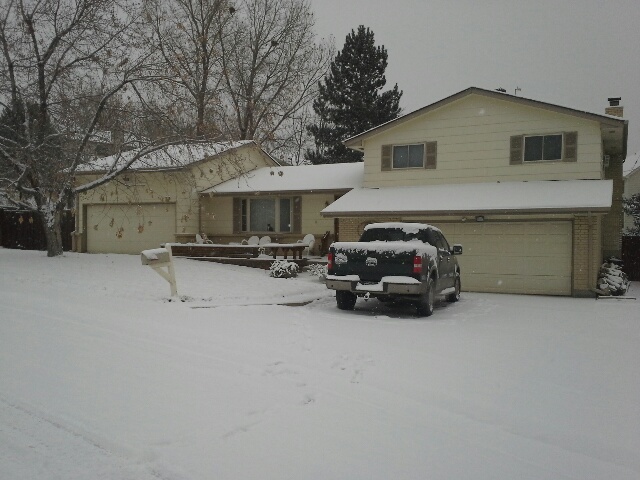 Here is what it looked like this morning at my house in Denver. It is now 5.4 degrees at my house. They say it will get somewhere between 10 to 15 below tonight. Yup real cold here too. It only got up to 63 today. It's down to 57 at 7PM. If it gets any colder we're gonna hafta turn the thermostat up so the furnace will start, we usually don't do that until December. In fact some years we don't use the furnace at all. yeah! 16" snow. its cold here! Hey, we got 1/4 inch rain just the other week.. I shut the window by my desk this morning - to keep the new kitten from jumping out. We don't have screens: no bugs. Well, I did have a scarab fly in and back out. Yes...and Yes. 15" of snow here on the ground in Northern WI with single digit temps. 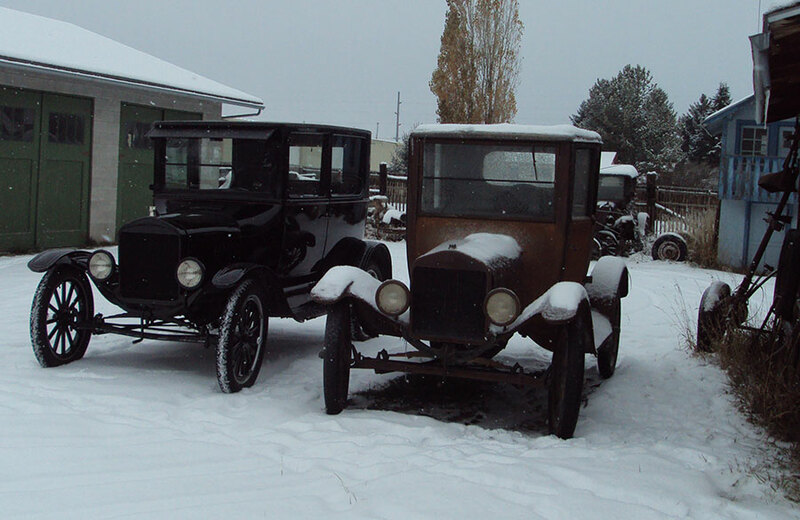 The Model T is put to bed for the duration. Wish this had held off for another month. 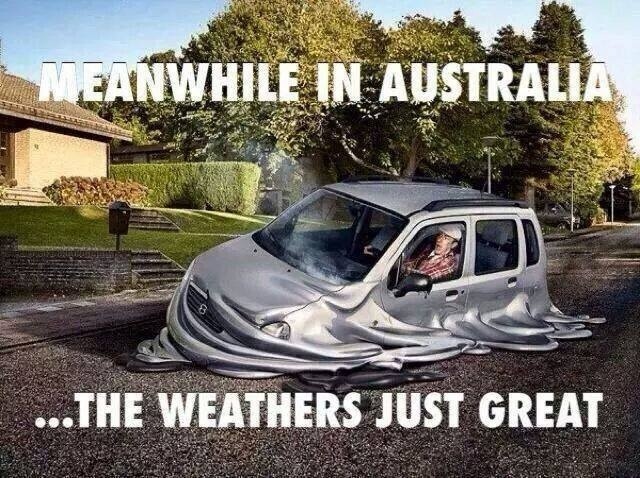 We're coming into Summer here in Australia. Two weeks ago I drove my '25 Tourer to a neighbouring town about 36km (22 miles) away. That was fine until it was time to head home. By then the mercury had soared to 37°C (about 98°F). Next time I think I'll put the top up and open the windshield. There's nothing unusual about the cold. It's just arriving early this year. 128 days to spring. I thought I read somewhere that El Nino this year would give us an unusually cold and snowy winter. So, it's looking like it will get a LOT worse before it gets better. I don't mind the weather change, but it is happening way to early in the season and is way to cold for the time of year too. Supposed to be 40's today here in the NY capital, but like everyone else will continue to drop. Not prepared for this yet. I wish I had a real heater in the garage. There is dust on my anti-freeze tester. 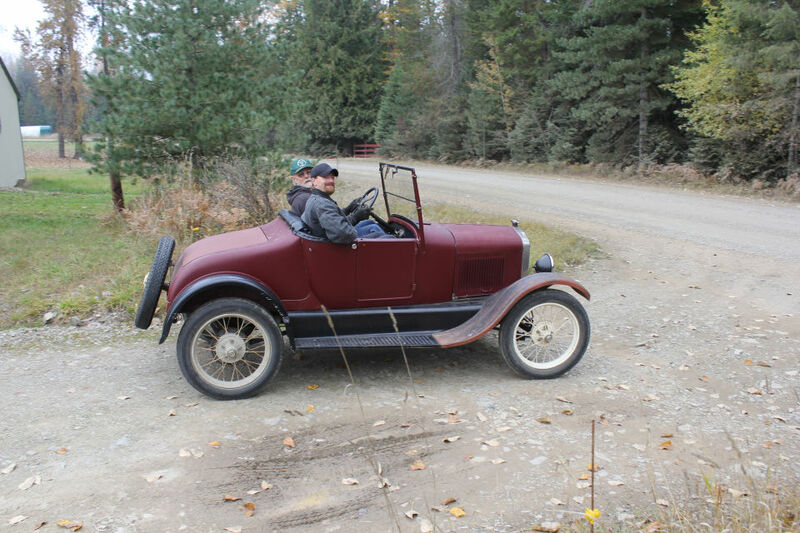 Usually I get the tester out on Thanksgiving week-end and test all the tractors, trucks, cars and Model T's. 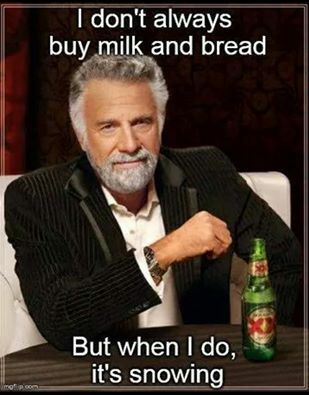 I had 35 degrees this morning in South Central Texas. 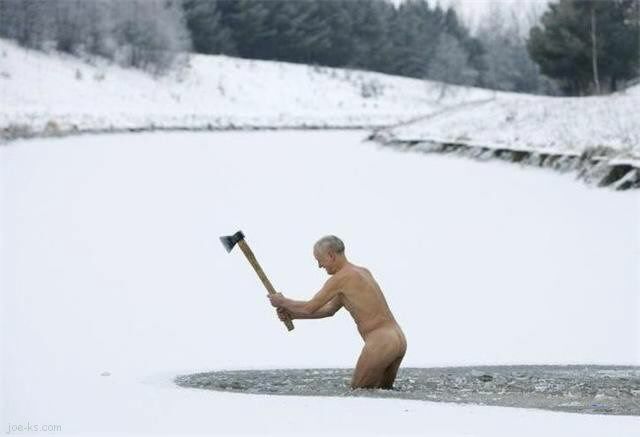 I think I better head to the town and find some anti-freeze. That is a lot cheaper than fixing a lot of freeze damage. Yep, you don't want those nickels popping out. We finally had to put one blanket on the bed and I now wear a pajama top, not just the bottoms. It gets into the high 40's or low 50's now at night, and into the high 60's or low 70's during the day. Soon we might even need to light a fire! while the east is starting to shovel snow, we are just beginning to rake up leaves! We might need to move Thanksgiving inside instead of eating out on the porch! I wish it would rain before our well goes dry. Worst drought in many years. it was 37 degrees early this morning south of Houston Texas. 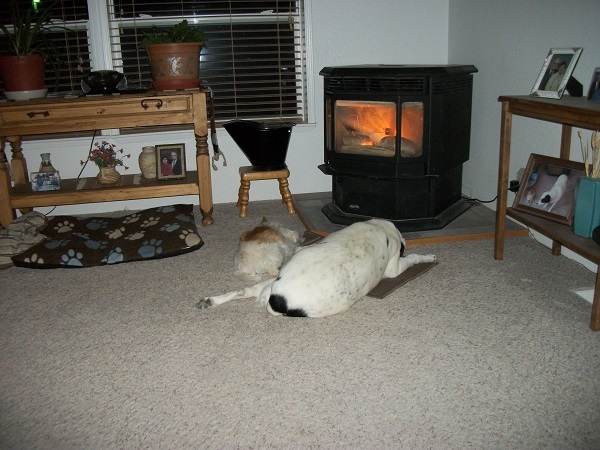 The dogs aren't the only ones who appreciate the heat. Tuesday was 60 degrees and no wind. Today it is snowing outside. We have old saying up here. If you don't like weather upstate, hang around for 10 minutes, and it will change. Temperature is 35 deg. Heading out for a couple of days camping south of Santa Barbara CA, highs in the 70's this weekend. It's been seventeen years since I moved from Nebraska and I think I like the weather out here better. Well, in Conroe, Texas it was 46 and clear all day. Worked in the garage without a jacket. Nice day. About the same yesterday when I took the '14 to town for lunch. 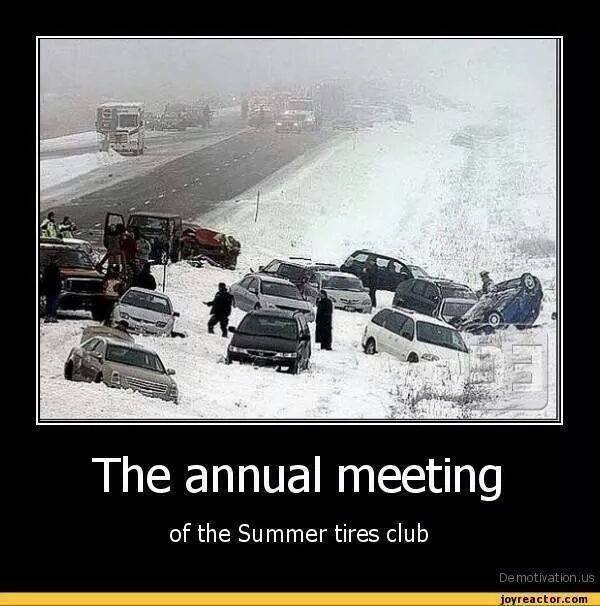 We'll be lucky if we even have a winter this year. It snowed today in Little Rock Arkansas! That does not happen often. I've got the shop thermostat set at 50 degrees. I changed filters in the furnace and the house is set at 69 degrees. Every once in awhile I grab the remote and light the fireplace. 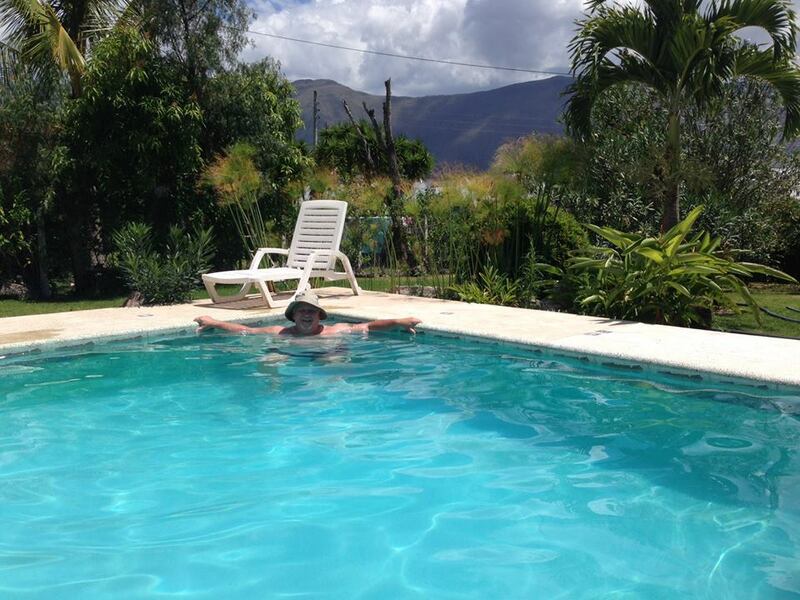 Bought a membership at the local gym and I've been spending time floating around the pool. I don't really want to float around in the pool but every time I lay back in the recliner some jerk yells "He's beached again, we're gonna have to push him back out!" Going down to 38° tonight. 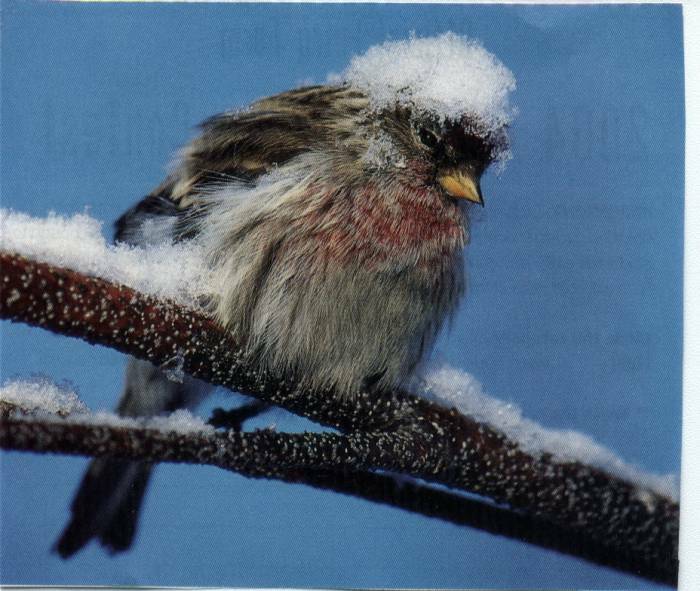 Don't know how we'll stand it ;o) Snow not in forecast yet. We dodged a bullet here in central Wisconsin. Most of the snow stayed to the north and the farther north you go the more snow they got. We have less than 2" of snow but it's cold enough for this time of year with little to no improvement for the next 8 days......highs of around 20º. I'm in eastern Montana hunting. -15 this morning and was -5 coming in tonight. No heated deer stands out here. I'm now sleeping in a camper instead of a tent so it's not to bad. About six inches of snow Sunday and Monday. Got my IPad and Verizon, Life's good!!! Geez John, thank you for reminding me of one of the reasons I quit deer hunting. Well that and several other reasons. I have to admit though, if there was someway I could afford to hunt in Montana and find a place to hunt, I'd be out there. Mule deer hunting is so much more fun then pounding the brush here in Wintersoda. -From 'The Frozen Tundra'- Barely a dusting, but temps have been mid-20's to single digits. Lambeau's surface is heated & covered, so all 'good to go!' I am pleased there's a Modine out in the shop - 35K/BTU heats things quickly to single-shirt working comfort. We had 2 inches on the ground yesterday, and it has snowed 7 inches in the last 3 hours. The high temp is only going to be 62 tomorrow. Might have to wear a jacket when I drive the Ts. 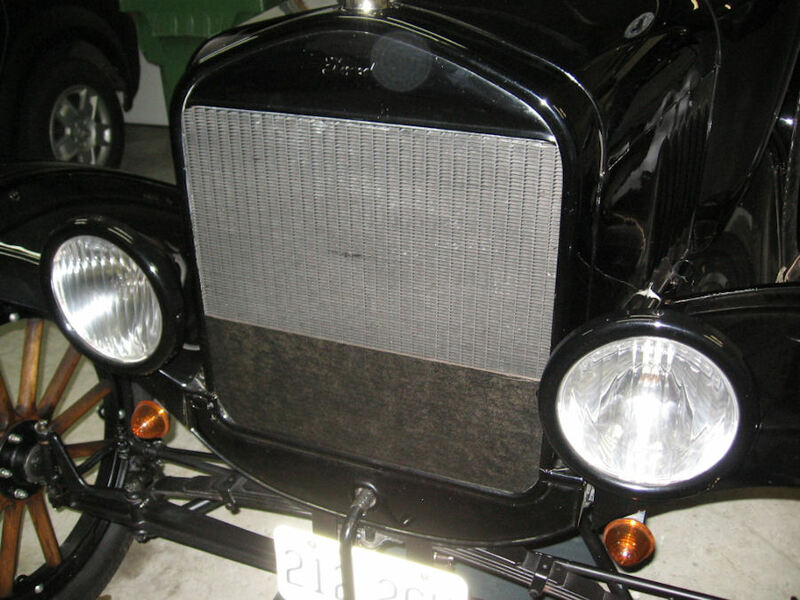 That light circle on the top part of the radiator shell isn't real, it's an artifact of the camera and flash. Harvey... I call that a K9 bun warmer! 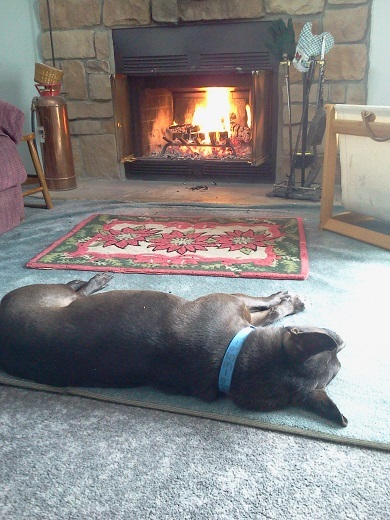 It's 20 right now in N. Ohio...here's how our dog spends winter too! How did you attach the cardboard? Nice clean installation! I cut the cardboard to shape, then used a wallpaper seam roller to compress the outer 1 inch of it so that it would slip into the gap between the radiator and shell. Then I gave it a light coat of satin black spray paint to help it blend in. Between the slip fit and the wind forces, I'm hoping it will stay put. Mark: is that an optical delusion or is your left head light looking to the left a little bit? No worries, it's an illusion caused by the camera angle and a slightly wide angle lens. What Royce did not say is that it was probably below 32 this morning even if it may make 62 tomorrow. More low temperatures are predicted for early next week. I am some what South of Royce and had a 36 degree reading this morning. I was one happy person because that load of antifreeze is on the floor board of my pickup. Update - I just got back from my morning drive with the cardboard winter front, it stayed in place and worked just fine, the engine got nice and toasty without overheating. Now I need to work on closing up the gaps at the front of my side curtains where they meet the windshield posts. Right now they act as cold air scoops. I could just tape them, but that would look a little tacky in my opinion. Maybe I'll try to fabricate some clips to snap onto the windshield posts that will pull the front of the curtains up tight. I read Gary's post above over and over and I am SURE it includes an invite to come join him in Ecuador. Thanks Gary ! LOL, they're accessories that limit your visibility and give the illusion that they'll keep out rain and hold in heat! Those improved car roadsters look pretty racy without a top. 19 below this morning but no wind so it is not as bad as it sounds. Heading home tomorrow and it sounds like 450 mile of snow and ice. All day to get there so it should be fine. Got a lead on some T stuff today. Guess I will be forced to have to come back. John - Trying to figure out from what you said, where you were where it was -19 degrees? Were you 450 miles north of Manhattan? Harold, almost in South Dakota. North of 212 between Alzada and Ekalaka. Now there won't be much going on in the Dakotas until the price of oil goes back nearer $100/bbl. 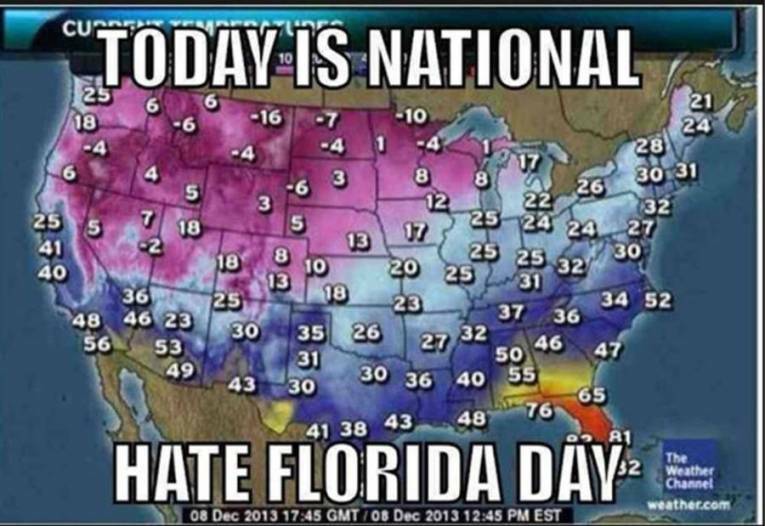 Ok, it isn't really the current temps -- but I thought it captured how some of you may be thinking. I don't won't to brag or anything but it's 73 here. 72 with the chill factor. It is 16.2 here in Denver and has been snowing all day long. But what the heck, make lemonade from lemons. I have a pork roast BBQing on the smoker and am going to have an inside picnic tonight! We had a little frost this morning. We took the A to breakfast. It is a closed car and has a rear seat belt for the grandson's car seat. Went for a nice ride afterward. It was 42 when we got home. I put on a jacket and gloves and cut the grass one last time. One started. One didn't. It's not Sunday unless we drive a T to breakfast. It got down to 0 last night and the coupe wouldn't catch so we broke the Tudor out of the garage. I washed it this Summer and don't want to get too much salt and snow on it but it was too cold to stick and the roads were fairly clear. You have a defective mechanic, Richard. According to Royce, your T should start on the first pull. Enjoy your winter. We have a mild Santana blowing heat off the desert. Since Mark Strange is just down the road a ways in Hillsboro, anything he says about the weather probably applies to me as well. We got our first dusting of the season yesterday and it has been trying to snow today as well. It's about 36, though, so not sticking. Yep, light snow here in Hillsboro as well, they were predicting up to an inch of accumulation. It's just starting to stick to the driveway, but I noticed that the city had sprayed the roads with de-icer solution yesterday, so the roads will probably stay clear. 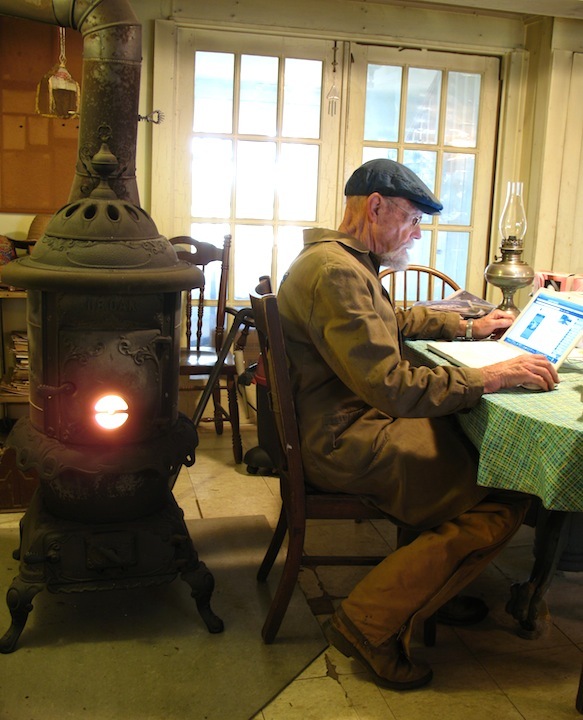 We got just enough snow to keep from harvesting the last of the corn so i'm going to watch the corn in the stove burn! If i can keep my eyes open i might watch Nascar wreck a few!! Bud. It got up to 20 degrees and the coupe started. I guess I'll put it in the garage til the cold snap is gone. It has a tired engine. In the 50's the rod journals were trued and the bearings refit. I put rings in it 18 years ago but it is loosing a little compression at low RPM's now. Maybe it's time to get rid of the cast iron pistons. Western NY is going to get 3-4 FEET of snow. They are going to get hammered! We should be pretty dry here in eastern NY and calling for high 40's-50's at the end of the week. But in the meantime, going to get 20's at best---maybe 30. Hap loved the map! It is supposed to get to 27 degrees here in Jacksonville tomorrow morning but I live close to the beach so we are supposed to stay at a balmy 35 degrees. In a previous life the Army sentenced me to 28 months in Fairbanks Ak....Fun while it lasted but was happy to regain my native Floridian status, I like thin blood. 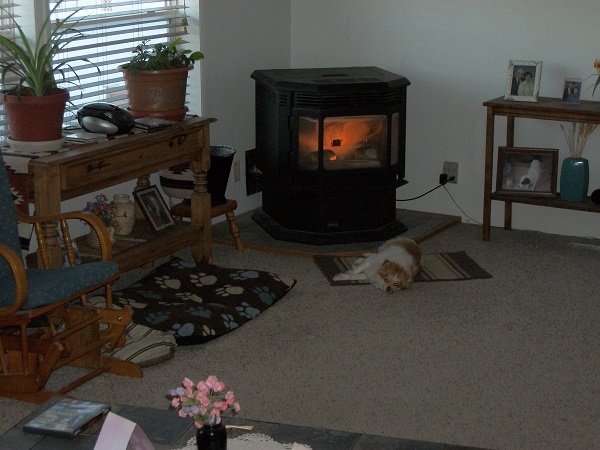 Our dog likes to keep warm also when it gets cold in California. 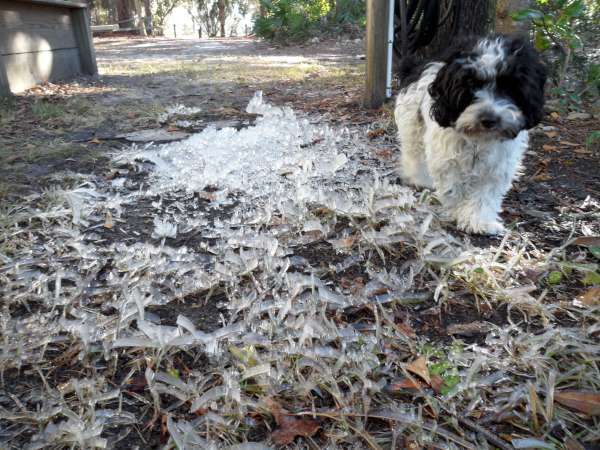 Here's our Molly dealing with ice for the first time. Friggin' 9 degrees here in wonderful N. Ohio...cesspool of the world!! Then maybe 50's Sun./Mon. and then back to the icebox after that right into Thanksgiving. Enough already! Expecting 4' of snow today in the "snowbelt", NE Ohio. Interesting to read the posts from Chad in the NY Capital district. Getting very heavy snow in St. Lawrence County right now. Expecting about 2 feet. Wind is causing 0 visibility at times. Chad, my brother lives in Clifton Park. Where are you in the Capital District. I am sure John Nichols from Carthage can comment on the snow today as they are getting it too and expecting more than we are. Samual Pine: I don't understand all the talk on other posts about putting the T up for the winter. What could be more fun than spinning doughnuts like you were doing. I drove my 12 to town day before yester day in 3 degree weather with NO SIDE CURTAINS. I was not cold, you just have to know how to dress. Dave--what keeps all that white stuff from falling onto the road? I am located 17 miles Southeast of Watertown, NY and about 4 miles from a part of Ft. Drum, NY. What breed is Molly ? old. I will post some pictures when I get some new equipment, but she loves the snow ! 4 months is a fun age, enjoy her! William, I am in South Colonie, just down the road so to speak from your brother. I would have expected John Nichols to have a bunch more snow than 5". It must be mostly south of him. I can't wait for the weekend to get here and warm a bit more. 45-50 is perfectly fine for me. About 50 miles from Massena and 50 miles from Watertown. John Nichols may be getting heavy snow now, most of the day the lake effect band settle on areas North of Watertown. Now it is slowly drifting southward,hitting the Watertown - Carthage area. In areas further North of us like Potsdam had blue sky and bright sun most of the day. Just read that Buffalo, NY has set a 24 hour snowfall record of 76". Hope everyone there is doing ok.
the wind had blown it up. Shih-Tzu mix. Her grandmother which we have is full blooded Shih Tzu from Korea. 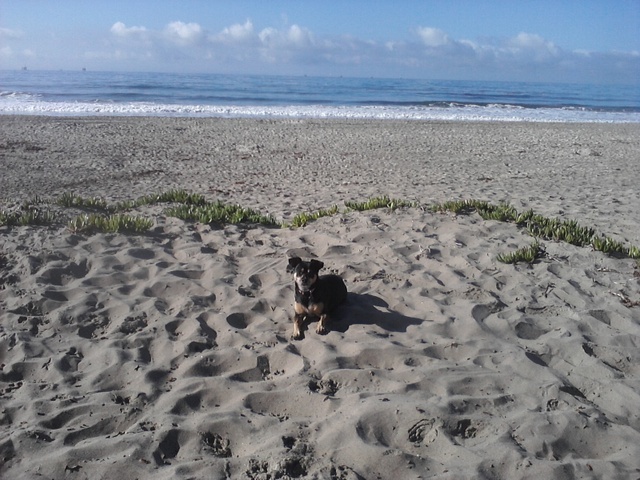 We have a little Yorkie named Ruby who is also from Korea. Sarah was a pick of the litter and loves going in the truck. I think she will be a natural for the T.
Just heard on the news Toronto has sent a bunch of snow removal equipment to help BUF dig out.We dogged the brunt of it and only got 5cm,s of the white stuff, but bloody cold! One of the reasons we do not have the snow that Watertown has is because while Watertown in the Lake Effect snow belt, we are on the fringe. of the snow and touch Telephone wires. Here comes the snow for me. Predicting 9-12" here in upstate NY starting in a couple of hours and ending Thanksgiving morning. Not a huge amount by any means, but it'll keep me busy keeping the driveway clear. The worst part for me is getting two family members off the main road when they get home, until I can get home to clear the driveway. Supposed to be 70 degrees here today. Sun with light wind. Cloudy but kind of nice up here in Carthage, NY. 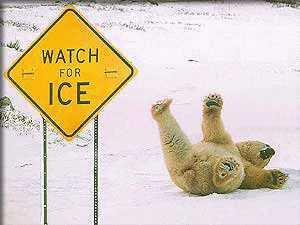 Had a bit of rain last night and some freezing and driveway was like all black ice. Now its gone. 20% chance of snow tomorrow. After that I will go day by day, but soon enough the big snow will arrive. Slept with window open, but one blanket on last night. Thanksgiving is suppose to be about 86 degrees. I guess we can eat out on the porch. We haven't needed any heat yet this season, but would sure like some rain. I think the poles have shifted. The north pole has moved to the Northeast and the desert has moved to southern California.